Wilbur A. 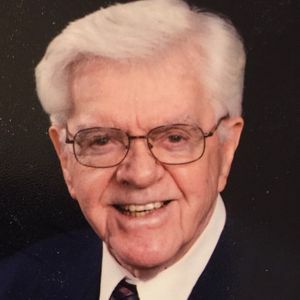 "Bill" Fiedler, age 95, passed away on Monday, December 3, 2018 at his home in Monona. He was born in Freeport, IL on December 7, 1923, the son of Anthony and Margaret (Allemond) Fiedler. He was educated in the Freeport Catholic Schools. He enlisted in the Army soon after graduating from Aquin High. He was a member of the U.S. 9th Army, 381st Engineer Combat Battalion serving in the European Theatre. Besides the American Theatre Ribbon and the World War Victory Medal, Bill was awarded the European Theatre Ribbon with Two Bronze Stars. On September 21, 1946 Bill married his childhood classmate and sweetheart Jean Bear. They resided in Janesville for 20 years where he was employed by the Amphenol Borg. Corp., and as an agent for the Prudential Insurance Co. While in Janesville, Bill was active in the Janesville Little Theatre. In 1966 the family moved to Madison where he was employed by the American Family Insurance Group as an Underwriter and later became Wisconsin Region Service Supervisor. Bill enjoyed bowling and gardening and was an avid Chicago Cubs and Bears fan. Bill and Jean and Family moved from Madison to Cottage Grove in 1977 until their retirement in 1987. They were members of St. Patrick's Church and Immaculate Heart of Mary. Ocala, FL was their home until coming back to Wisconsin in 2002, where they resided in Sun Prairie and Monona. While there, they had many card playing friends, and along with other retirement activities, spent time at Blessed Trinity Soup Kitchen feeding the poor. Besides his parents, Bill was preceded in death by his brothers Robert and Richard; and grandson Christopher. He is survived by his wife Jean; children, Garrett of Janesville, Brian (Sandy) of Monona, Kevin (Kay Ann) of Brookfield, and Shaun of Houston, TX; 6 grandchildren; and 2 great-grandchildren. A Mass of Christian burial will be held at 11:00 a.m. on Friday, December 7, 2018 at St. Patrick's Catholic Church, 434 N. Main Street in Cottage Grove with Father Brian Dulli presiding. A visitation will be held from 9:00 a.m. until the time of the Mass at the church on Friday. Burial will be in St. Patrick's Cemetery in Cottage Grove. Memorials can be made to Immaculate IHM Preserve-Plan Campaign. The family would like to thank AgraceHospice for their care and support and very special friends Peggy Weber and Amy Koppes. The beautiful and interactive Eternal Tribute tells Wilbur's life story the way it deserves to be told in words, pictures and video.